Lindsey Vonn was back on skis at Vail on Thanksgiving Day — just nine days after re-injuring her rebuilt right knee – and the U.S. Ski Team was thankful to have its top gun on the road to recovery after a disappointing weekend on Beaver Creek’s new Raptor downhill course. Vail’s Vonn wasn’t able to make her comeback Friday from a blown knee last February, but plenty of depth on the U.S. women’s speed squad had raised hopes for an American podium on the new course designed and built for the 2015 World Championships. 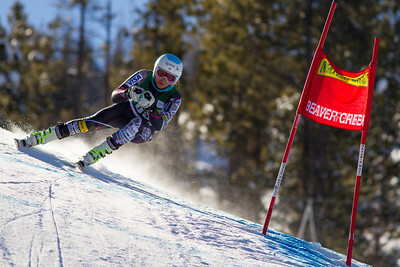 Julia Mancuso in action at Beaver Creek over the weekend (USSA/Cody Downard Photography). But no U.S. woman cracked the top 15 in Friday’s World Cup downhill and no Americans were in the top 20 in Saturday’s super-G, both won by Switzerland’s Lara Gut. Squaw Valley’s Julia Mancuso, the most decorated female ski racer in U.S. history, was philosophical about her 20th-place finish on Friday. It makes sense Mancuso is already thinking about the 2015 Worlds. The three-time Olympic medalist also owns five world championship medals. In fact, Mancuso has won more Olympic and world championships medals combined (eight) than regular-season World Cup races. But Mancuso was 29th in Saturday’s super-G and failed to finish her second run of giant slalom on Sunday. Mammoth Mountain’s Stacey Cook had the top American time in the downhill Friday but finished more than two seconds behind Gut in 19th place. She was 28th in the super-G Saturday. Mancuso, Cook, Leanne Smith and Laurenne Ross all climbed on World Cup downhill podiums (top 3) last season, and Vonn and Alice McKennis of Glenwood Springs – both of whom are recovering from injuries – won downhills. So picking a four-member team for the 2014 Winter Olympics in Sochi, Russia, in February could be interesting. Vonn, who returned to snow Thursday just nine days after a training crash at Copper Mountain, is now trying to come back in time for next weekend’s World Cup races at Lake Louise, Alberta, Canada, where she’s won 14 times. The defending Olympic downhill champion admitted earlier in the week on the Today Show that she’s not sure how her re-injured knee will hold up to renewed training. She partially tore the anterior cruciate ligament in the same knee rebuilt after last February’s crash at the World Championships. She also told Today her recent crash would have been worse without a knee brace. Vonn told reporters in November she still has plenty to accomplish in her sport, including getting four more regular-season World Cup victories to set the all-time mark for wins by a woman. Vonn also wants very badly to defend her Olympic downhill gold — the only one ever claimed by an American woman – but says she isn’t as concerned about surpassing Mancuso’s mark for the most Olympic medals won by an American woman (three).